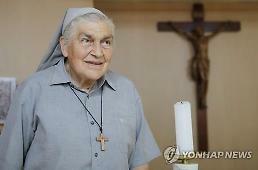 A South Korean committee involving figures with high social reputation was launched to put up two retired Austrian nurses as Nobel Peace Prize candidates for their long service for lepers. The 35-member committee, headed by Kim Hwang-sik, a former Supreme Court justice who served as prime minister from October 2010 to February 2013, agreed to recommend the two as Nobel prize candidates in January next year. President Moon Jae-in has signed a petition calling for their nomination. The campaign dates back to 2005 when Marianne Stoeger, 82, and Margareta Pissar, 81, left home after ending their voluntary sacrifice caring for lepers for four decades at an isolated shelter on Sorokdo Island off the southern coastal county of Goheung. The shelter was built in 1916 during Japan's 1910-1945 colonial rule over the Korean peninsula, as a concentration camp for leprosy patients. South Korea later transformed it into a state-subsidized community center with a modern hospital, farmland and welfare facilities. After graduating from the nursing college of the University of Innsbruck, the two started working as volunteer nurses in the Sorokdo hospital respectively in 1962 and 1966. After their departure in 2005, they were respected as "Angeles" among community people or likened to Mother Teresa, known in the Catholic Church as Saint Teresa of Calcutta. In 2006, the two nurses were offered given honorary citizenship. "Marianne and Margareta," a film depicting their life, was screened last year at the government complex in Seoul.